It’s Denise again! (And here I told you all that Heather was in charge of the giveaway!) I hope you’re having fun and I think you’re going to LOVE today’s giveaway item! 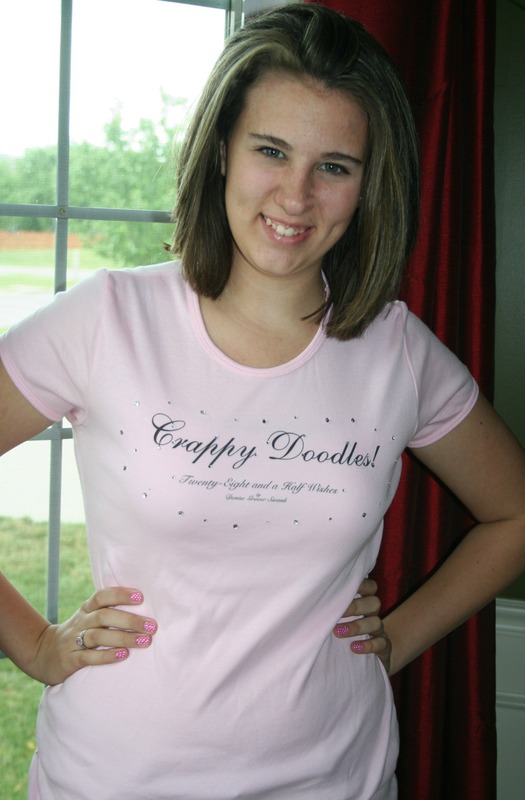 Your very own Crappy Doodles t-shirt!!! Some days are just crappy doodle days, so what better way to tell the world than wear it on your shirt? 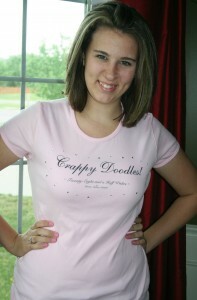 I have one of these and I love this shirt, and not just because it says Crappy Doodles! It’s a really soft, stretchy cotton and although it’s fitted, it doesn’t cling. This particular shirt is Bedazzled. You can choose to NOT have your t-shirt Bedazzeled. (Bedazzling courtesy of Julia.) I have a few sizes at my house BUT I can order a different size. If you win, I’ll give you a sizing chart to see what works for you. And if you don’t win, don’t be sad. I might be giving another one or two of these away, OR you can buy your own on Zazzle. Have you ever said the words Crappy Doodles? Be honest now! (No deductions if you haven’t!) I’ve had several readers tell me they said for awhile after reading Twenty-Eight and a Half Wishes. You have until Tuesday midnight CDT, June 19 to answer. Winner will be picked by Random.org. Have you ever said Crappy Doodles? The winner of the Day 3 giveaway is Emilia A! We will be contacting you by email to get your address. Congratulations. We hope your son approves of your new shirt. Yes. I started using it when you started posting that phrase on twitter :) Normally only use it around kids when I’m trying not to use other words. With two kids at very impressionable ages I believe I have said crappy doodles. Yes, I have!! I find myself picking up all kinds of great quotes from books I l love and “Crappy Doodles” is right up there with my use of “Butterflying” from Colleen Hoover’s books! Your Comments I even said it prior to reading your book. Great minds thing alike and all! nope-but it has a nice ring to it . . .
I’m not certain but I do believe I have said it a time or two. At least once or twice ;) usually at my computer screen. Day three is now closed. Emilia A. was the winner of a new Crappydoodles t-shirt. I find myself thinking it, but I don’t think I’ve said it out loud. Es decir, el software es de-sarrollado y mejorado por los usuarios.